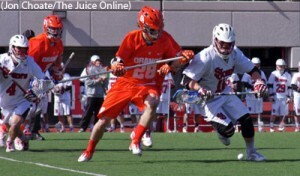 Nick Mariano scored two goals and added three assists, and Brad Voigt and Brendan Bomberry each added two goals as Syracuse survived a late rally from St. John’s for a 9-8 win on Saturday afternoon. 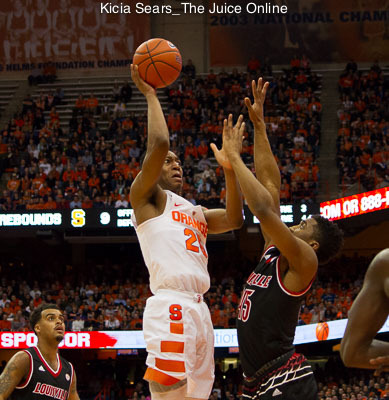 It was Syracuse’s fourth straight one-goal game, though it didn’t look like it would be that way at the start. Voigt started the scoring with 9:16 left in the first quarter, part of four goals within a minute span. Jordan Evan’s capped the four-goal spree with 8:16 left, as the Orange took a 5-1 lead after one quarter. But St. John’s dominated possession in the second quarter and outshot the Orange 17-4. A Colin Duffy goal with 1:54 left before halftime pulled St. John’s to within 6-4. 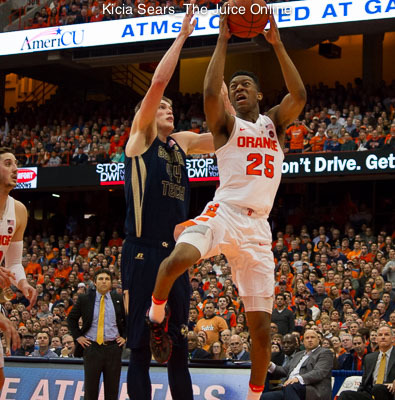 Syracuse had appeared to put the game out of reach after Sergio Salcido scored unassisted to give the Orange a 9-6 lead late in the fourth quarter. But with 54 seconds left, Jackson O’Leary beat Evan Molloy to pull the Red Storm to within a goal. It was the third time in the half St. John’s had been that close. Ben Williams won the ensuing faceoff, but Paolo Ciferri coughed up the ball with 35 seconds left, setting up Scott Scannell for a potential game-tying shot as time expired. But the shot went wide, and the Orange remained perfect against the Red Storm, upping its record to 11-0 against its former Big East rival. Molloy recorded nine saves, while Williams won 13 of 20 faceoffs. Scannell and Nick Heller each had three points to lead St. John’s.